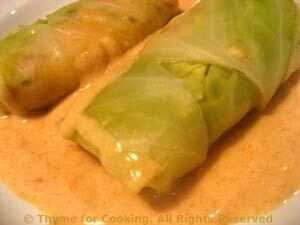 Stuffed Cabbage Rolls with Creamy Paprika Sauce, Thyme for Cooking starters. Small cabbage rolls, stuffed with a bit of leek, ham and polenta and braised, make an easy first course. The rolls can be made ahead, then left to braise for 30 minutes before serving, making them an easy party dish as well. Serve with a creamy Paprika Sauce. Remove any damaged outer leaves from the cabbage and discard. Remove 4 outer leaves for the rolls (see note). Bring a large pot of water to boil and blanch the leaves for 1 minute. Cover the pot if you can't keep the leaves submerged. Trim leek and cut in half the long way. Cut each half in half again, so you have long quarters. Thinly slice. Heat oil in medium nonstick skillet. Add leek, bacon and sauté until leek is tender and bacon cooked. Add stock, basil and heat through. Pour into a bowl, add polenta and stir well. Lay the cabbage leaves as flat as reasonable. Cut out the tough stem in a deep, narrow 'V'. Normally this cut will be about half the length of the cabbage leaf. Take a leaf and lay it with the round end toward you and the (former) stem end away. Place 1/4 of the stuffing on the round end and fold the cabbage leaf over snugly. Tuck the sides of the leaf in, folding over the rest of the leaf to the size of the roll. Roll it up and set aside, seam side down. Repeat. If there are tears in a leaf, just adjust as you roll. Place the cabbage rolls seam side down in the skillet. Add stock, white wine and paprika and bring to a boil. Reduce heat to a slow simmer, cover and braise for 30 minutes. Check occasionally and add water or stock as needed. Increase heat under braising liquid. Add more stock or water if needed, to make app. 2/3 cup. Dissolve cornstarch in water and add to skillet, stirring until thick. Divide the sauce into 2 flattish soup bowls or plates. Top with cabbage rolls and serve. Note: To remove cabbage leaves first locate the outermost leaf. Cut the stem end from the main stalk. Starting opposite the stem end, carefully roll the leaf backward (like you would roll down a sock) until you can loosen it from the stem end. Try not to tear it, but no problem if you do; all will be hidden when you make the rolls. Repeat for each leaf.